Teachers will learn new strategies for teaching science to K-6 students. Photo by Jim MacKenzie. Nearly 1,000 aspiring teachers in San Francisco and San Diego will learn cutting-edge techniques for teaching science to young children whose first language isn't English as part of a collaboration led by UC Santa Cruz. The needs of English language learners are a high priority because they now make up about 20 percent of all K-12 students in the United States--and nearly 50 percent of students in California, according to UCSC education professor Trish Stoddart, who is leading the collaboration. "A major problem is that most teachers are not being prepared to teach subject matter to English language learners," said Stoddart. "Our goal is to change the way we prepare novice teachers." Stoddart has developed, tested, and refined new strategies to help students who do not speak English as their first language learn science. With $3.1 million from the National Science Foundation, she is sharing her model with faculty at San Diego State University and San Francisco State University, who will integrate Stoddart's instructional practices into their programs. Aspiring teachers will use those techniques during their stints as student teachers, as well as in their jobs after graduation. Ultimately, youngsters in kindergarten through sixth grade will benefit from the integrated approach to science and language instruction. Stoddart's approach engages students in the phenomena they're studying, which generates what she called a "synergistic" effect. "It brings science alive, which provides a very powerful context for learning language, because it gives the words meaning," said Stoddart. "There's a reciprocal relationship between language and science. The learning in each domain enhances the learning in the other." Educational experts hope to reverse two troubling trends: a "pattern of underachievement" among English language learners marked by test scores that are about 20 percent lower than the scores of native English speakers, and the declining number of students choosing careers in science. "There are national and international concerns about low levels of science achievement," said Stoddart, a member of a binational U.S./United Kingdom task force on science education that aims to encourage more students in both countries to study science. The success of Stoddart's model hinges on an approach that bridges the divide between science and language instruction, which aspiring teachers typically learn about in separate courses. Instead, CSU faculty will teach science and language instruction together, and instruction will emphasize the use of contextualization, collaborative inquiry, and instructional conversations. "Teachers learn to teach science in ways that engage students," said Stoddart. "Hands-on science activities are related to the local environment, whether it's the ocean, weather patterns, or local plants and animals. They are related to parts of their everyday lives." Language lessons relate to hands-on activities and objects. "Vocabulary is never taught by just listing words on the blackboard," said Stoddart. "When a teacher uses a word, it's related to a physical object or activity or to a picture or graphic representation." "You can learn as many new words in a science lesson as you learn in a foreign language lesson," said Stoddart. "Science is very language rich." Stoddart has developed this portfolio of strategies during more than two decades of research. Her methods have been adopted by the teacher-education program in UCSC's Education Department and implemented in some local schools, but now it's time for wider implementation, she said. "Our role at UC is research," said Stoddart. "We develop model programs. When we've got a successful model, we need to go beyond UC and scale it up. We're hoping to have impact statewide." California State University campuses prepare about 10 percent of the nation's teachers. This project will reach nearly 1,000 aspiring teachers in San Diego and San Francisco over the next three years. Half will be introduced to Stoddart's model of integrated teaching, and half will learn the traditional approaches to teaching science and language arts. Stoddart's team will monitor and compare the impacts of teachers in each group during their stints as student teachers and into their first year of classroom teaching. 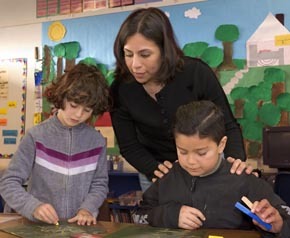 In addition, Jerome Shaw, an assistant professor of education at UCSC, will assess the science achievement of K-6 students taught by both cohorts of aspiring teachers in school districts with high proportions of English language learners. The study of student achievement will involve up to 25,000 public school students over the next five years. "The research will focus on proving the efficacy of these techniques in teacher preparation and on the impact of this pedagogy on K-6 students," said Stoddart. Note to journalists: Trish Stoddart may be reached at (831) 459-3850 or via e-mail at stoddart@ucsc.edu.